I had to work today and my weekend will be cut short, since I don’t have off on Monday. Therefore, this post will also be short because I am limited on my time! After a nap, I buzzed around the house doing dishes, laundry and picking up in general. Unfortunately, I have been a slacker in the fitness department this week. I really miss the gym, but when my body hurts from running around all day at work, I can’t justify going to the gym for a workout. Sometimes you just have to listen to your body and rest. 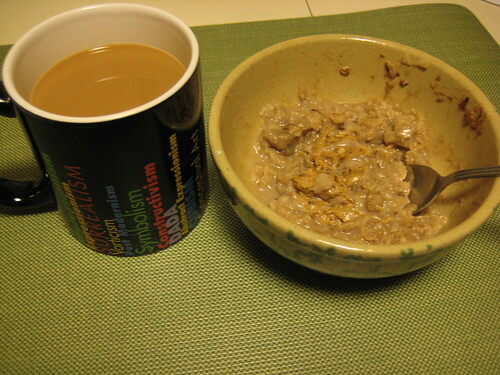 Breakfast today was the rest of the stovetop oats I made for breakfast yesterday–I put a half of a banana in it, NuttZo and chocolate chips. Next time, I will skip the banana because the chocolate and nut flavor would have been perfect. I snacked on a banana at work this morning and then ate my lunch while geeking out doing my family tree. Like I said before, I had the opportunity to work with some local genealogists and had help researching my family tree. I have a lot of information on my dad’s side, but had names and dates for my mom’s and didn’t know a lot about it. I got a few more pieces of information filled in today, so that was cool. Last night, I stayed up late and finally figured out that a misspelling in a town name on my dad’s side had stopped me from finding the area in Germany they were from. Finally, I read through some history and found the district of Neubrandenburg, Germany and the correct spelling and city where my ancestors originated from. I love history and majored in it in college, so it makes sense that I love discovering all of this information about my family. We are supposed to get hammered by a big snow storm tonight and I hope that doesn’t change my plans for brunch with the girls and Whole Foods after tomorrow. That’s all folks–it’s getting late here and I’ll write a longer post tomorrow. 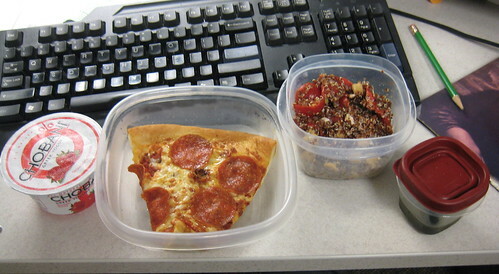 This entry was posted in Food and tagged Chobani, Coffee, Oatmeal, Pizza, Quinoa, yogurt. Bookmark the permalink.